Ironbridge Power Station Cooling Towers: Monuments To Global Warming? Here’s a piece of history to look down on. It was captured a couple of winters ago from Wenlock Edge – steam rising from three of the four great cooling towers that served Ironbridge power station on the banks of the River Severn. A last gasp if you like, for in November 2015, after fifty odd years of coal-fired production, and a last minute fling with wood chips, the station generators were switched off. The cooling towers, however, remain. Their future is uncertain – to be demolished or re-used: who knows. What is known is that until the last-ditch biomass conversion, Ironbridge Power Station was among the UK’s dirtiest electricity producers. In 2003 Friends of the Earth were calling such power stations (most built in the 1960s) carbon dinosaurs. FOE made their point by producing a table of the worst carbon emissions polluters, each rated by a fossil factor based on the amount of carbon dioxide emitted per unit of electricity produced. Ironbridge was ranked at sixth place with a fossil factor of 9.4. By way of comparison the table included a gas-fired power station with a fossil factor of 5.4. Of course pollution is nothing new in this part of Shropshire. The Severn Gorge through Coalbrookdale and Ironbridge has a several hundred year heritage of carbon fall-out. Much of this history is preserved and explained in the Ironbridge Gorge Museum complex that includes ironworks, china works, workers housing and a decorative tile museum housed in the original factory. The place makes strong claims to be the birthplace of the Industrial Revolution. It was here from 1609 onwards that the Quaker Darby family pioneered the use of coke instead of charcoal in their blast furnaces, and worked flat out to promote cast iron in every possible permutation – from steam engine boilers and cannon to garden seats and hat stands. By the late eighteenth century, a new class of well-heeled see-Britain tourists would write of the fiery outpourings of forge and furnace as if they had ventured into hell itself. There was the ear-splitting clang of steam-hammers, the sulphurous fumes, the heat, smoke, the monstrous machines, and unnerving ingenuity of the men who had contrived this living techno-nightmare. There was also the shocking novelty of the world’s first cast iron bridge which alone attracted thousands of tourists. New coach services and a hotel with bridge view were laid on specially. Built in 1779 as a public relations promotion for versatility of cast iron, the Iron Bridge still draws hundreds of thousands of visitors from all over the world. And the Gorge that it spans, just a step or two downstream of the power station, is designated a World Heritage Site. All of which is a touch confusing when you start to think of it. Too much irony by half in the Ironbridge locality. On the one hand dirty coal-fired power stations are bad. I think everyone is agreed on that. On the other hand, heritage is good: it preserves important things that we need to know about, and every year up to half a million people come to Ironbridge to celebrate Britain’s industrial past. But here’s the rub, also much provoked by today’s Guardian headlines about the world’s likely failure to meet the global emissions target. If carbon emissions cause global warming, and the ironmasters of Coalbrookdale were responsible for inventing coke fuelled manufacturing, and promoting its use, then suddenly Shropshire has a very discomfiting claim to fame. This present-day scenic agricultural county is the place where it all began – man-made global warming? 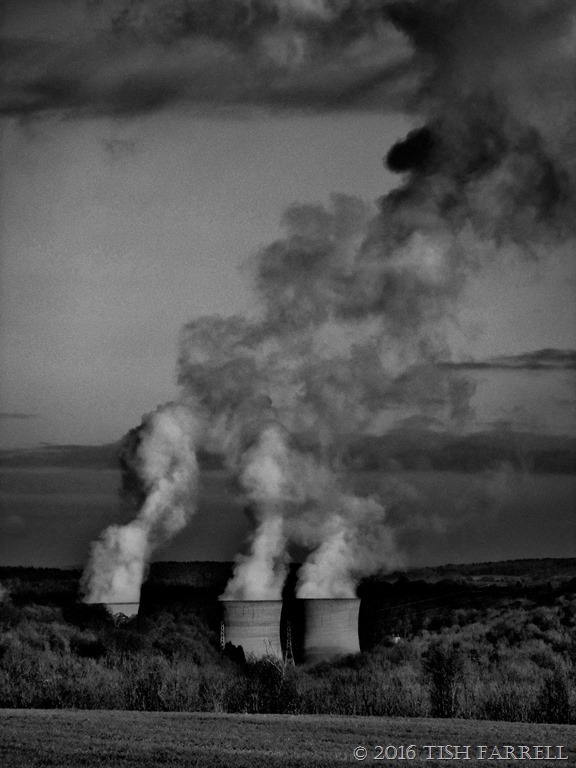 Posted on August 7, 2016 by Tish Farrell	This entry was posted in Environment, global warming and tagged black & white photography, carbon emissions, Friends of the Earth, Ironbridge Gorge World Heritage Site, Ironbridge Power Station, Tish Farrell Writer. Bookmark the permalink. I rather like those rose-coloured cooling towers. I do hope they remain. We are all grateful for progress, however delayed. At least they aren’t nuclear plants with all that hazardous waste to protect. That surely is blessing, but I think their prolonged fall-out might have had an effect on local well being. Not the sort of stuff that gets documented. I think they should stay too. They have an epic presence. Though many people think they spoil the view. They might also serve to keep us focused on the climate change issue – if we wake up in time. Ah. Now we know who to blame. T’was coal that fueled us into the Industrial Revolution, the beginning of the mining, the factories, the steam engine, and all the other glories of the modern age including global warming. Another great post where you make science and history both comprehensible and interesting because you anchor them so locally, and filter them through a keen mind and superlative writing. I really think the buildings themselves should be preserved, they are part of the world’s history, not just Shropshire. I think we could make something of them. During the bi-centenary of the Iron Bridge they were lit up at night, and looked phenomenal in the Gorge. I think there’s a danger too that some of our heritage attractions – even the industrial ones, tend (if not intentionally) to sentimentalize the past; as if it’s all fish and chips and gob stoppers. I do see your point, Janet. And at least they no longer spew, which actually makes them rather mysterious. I think if you saw them in their context, you might see them in a different way. They have a certain symbolic power. A most informative post, Tish, and I agree with Meg’s comment…. It will all come down to cost of maintaining them I suppose. One local objector pointed out that the 1960s materials they were built of is like to decompose quite quickly. Thus speaks the wise architect. They were actually architect designed and sited, so we should perhaps keep them on those grounds too. Industrial architectural design gets too much overlooked. Yes and they have a lot of potential to change their use. This is especially because they have so much space one can do so much with it. I guess we’re all culpable to some extent, Tish, but it certainly seems hard to put the brakes on now we’ve acquired a little knowledge. I’m wishy-washy on this one. Whenever i pass by the ones at Pontefract I grimace and look away. It is a difficult situation to unpick, you’re so right, Jo. And inevitably we are all complicit. But I guess we know enough now to be more mindful of the consequences of our actions. That’s a great photograph for a B&W challenge, Tish, even if the subject matter is, at the very least, disconcerting. Here, they talk of “clean coal”, a misnomer if ever there was one. Of course, that’s pushed by the political party that refuses to recognize Man’s role in global warming. Makes you want to walk onto a bridge, grab your face with both hands, and just scream. You’ve put the problem in a nutshell. So you and me on that bridge together, having a good scream. It’s not as if we don’t have alternatives to dirty fuel. And it’s not as if we don’t know how to clean up and regenerate the environment. How brilliant that coal fired power station is no more. I wish we would learn from this example over here in Australia. Coal is still the most common source of electricity over here even though climate change is becoming an increasingly frightening reality. I really hope the world wakes up fast and starts acting immediately. hear, hear to that Suzanne.